Server window showing the advanced settings. One RPC per update. When this is enabled, the server will execute at most one RPC per client per update. This will have minimal impact on the games framerate, while still allowing kRPC to execute RPCs. If you don’t need a high RPC throughput, this is a good option to use. Maximum time per update. 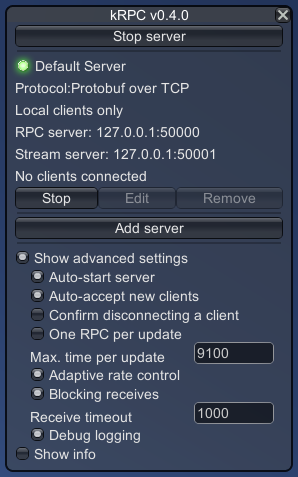 When one RPC per update is not enabled, this setting controls the maximum amount of time (in nanoseconds) that kRPC will spend executing RPCs per FixedUpdate. Setting this to a high value, for example 20000 ns, will allow the server to process many RPCs at the expense of the game’s framerate. A low value, for example 1000 ns, won’t allow the server to execute many RPCs per update, but will allow the game to run at a much higher framerate. Adaptive rate control. When enabled, kRPC will automatically adjust the maximum time per update parameter, so that the game has a minimum framerate of 60 FPS. Enabling this setting provides a good tradeoff between RPC throughput and the game framerate. Another consideration is the responsiveness of the server. Clients must execute RPCs in sequence, one after another, and there is usually a (short) delay between them. This means that when the server finishes executing an RPC, if it were to immediately check for a new RPC it will not find any and will return from the FixedUpdate. This means that any new RPCs will have to wait until the next FixedUpdate, and results in the server only executing a single RPC per FixedUpdate regardless of the maximum time per update setting. Instead, higher RPC throughput can be obtained if the server waits briefly after finishing an RPC to see if any new RPCs are received. This is done in such a way that the maximum time per update setting (above) is still observed. This behavior is enabled by the blocking receives option. Receive timeout sets the maximum amount of time the server will wait for a new RPC from a client.